Been a mad-rush January so far, particularly this weekend... forgive me if I don't get to comment on your photos as quickly as I would like, I will catch up! Got home late and tired last night and was stunned at all your lovely comments on my misty sunrise photo - hope the 'car roof' info might help someone else one day, and above all I was so pleased that people seemed to like it and said such nice things - you are wonderful ... mwah! Wow this is amazing, the light is perfect, excellent DoF and shot. who knew clover could be so stunning! Really love this!!! heehee a leafy popsicle! OMG sooooo cool! lol pardon the pun... but seriously, that is awesome!! Awesome shot. I love the frost. Phil - this is gorgeous! Your point of view is perfect! Awesome shot! 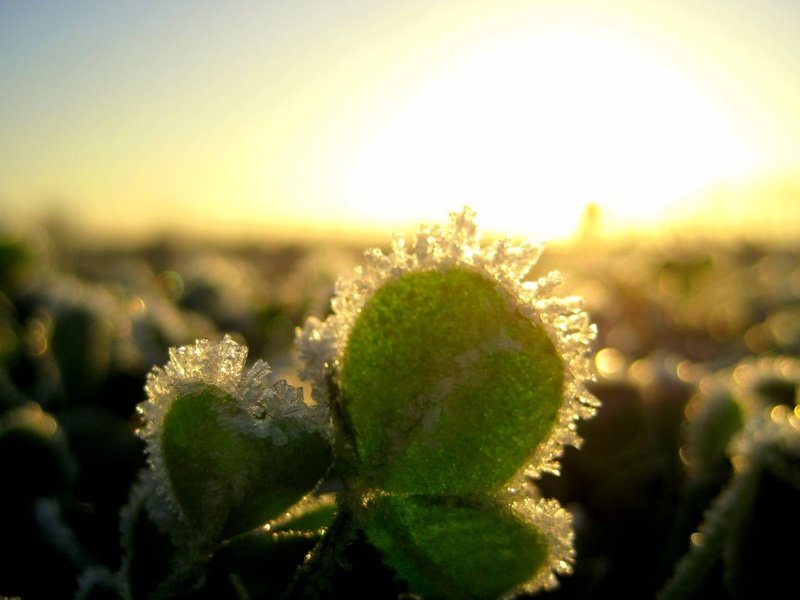 Amazing how the frost is "framing" that clover. And the light is gorgeous. This is even better on the magnified view. Super closeup. The clover leaf on the left looks almost heart shaped. Such a great capture. A gorgeous and very detailed shot! I love the sun in the background.